A British safety standard from 1947 that requires the top hole of the 3-hole socket to have a “shutter” on the inside means that the live and neutral holes can’t be accessed until the shutters are opened. That happens when the earth pin of the plug is inserted into the top hole, thus opening the shutter. 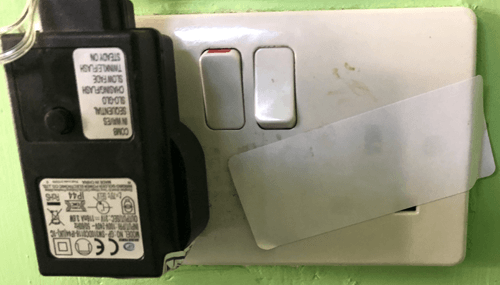 Only by inserting a plug, with a top pin, can the shutter be opened, which in turn activates the live part of the socket… making the socket safe – so there is no need to cover it; even little children’s fingers won’t open the socket. So there is no need to use “child safety covers” which have actually been found to be dangerous, or address labels! When you arrange PAT testing you may be offered an additional service called “socket testing“; this practice usually involves telling you if something dodgy is spotted with a socket; we don’t charge you for that – we just tell you… DRA PAT Testing – keeping it simple!